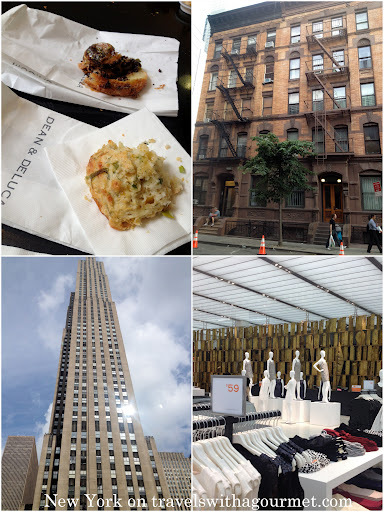 On our first morning, we headed off to Fifth Avenue for some much-needed retail therapy and to take advantage of the end-of-summer sales. We headed straight for a quick breakfast at the centrally-located Dean and De Luca in Rockefeller Center. This is a classic NY deli/cafe where one can be assured of good coffee and lots of amazing stuff to eat. We shared a cheddar cheese scone and a sticky breakfast bun with some strong coffee and got ready to pound the pavement. First stop was the new Canadian brand Joe Fresh and their flagship US store where there were loads of great bargains to be had. Next was the 8th floor of Saks Fifth Avenue which is their special shoe department (with their own dedicated zip code) where we ended up spending a few hours trying endless pairs of pumps and sandals until finally making our selections. We still had Madison Avenue to get to so before lunch, we ended up at the J Crew Collection boutique on Madison and 79th where we bought a few more things which they offered to send to our hotel free-of-charge. Next was a quick lunch at Serafina across the street. It was an overcast day so we didn’t get a chance to eat on their roof terrace but stayed on the mid-level overlooking the street. The place was packed with groups of ladies and families having a lively lunch. The menu is extensive with antipasti, salads, pastas, main courses and pizzas. We were tempted to have one of their famous pizzas but instead opted to share an arugula and Parmesan salad to start which came served with a basket of fresh ciabatta then pasta as our main course. 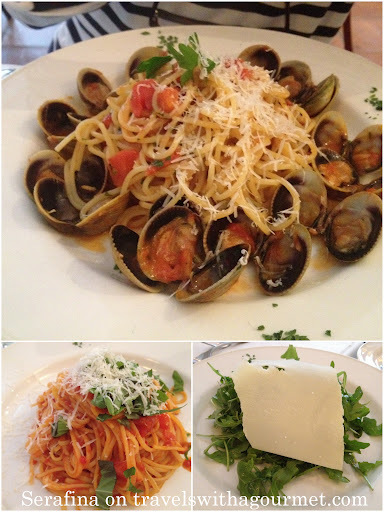 T had her favorite, linguine alle vongole veraci (clams in a tomato, garlic and white wine sauce) while I had the classic spaghettini pomodoro e basilico (plum tomatoes, extra virgin olive oil and basil). Both were delicious and perfect for a quick light lunch. We skipped dessert and had espressos to end our meal the hopped in a cab to go back to our hotel with all our purchases. *Open daily from 11:30 a.m. to midnight. No reservations taken except for large groups.